Once upon a time cottages were simple wooden structures on a lake or in the woods, often hand-built by our parents and grandparents over several years. Opened in the spring and shut down in the fall, they offered fresh air, simple pleasures and the enjoyment of quiet family weekend escapes — usually involving a bit of maintenance work. Well, times have changed, and so has the very definition of the word “cottage.” These days, Ontario families looking for a home away from the city are demanding all the comforts and luxuries of a four-season home in cottage country — and builders from across Ontario are more than willing to oblige. 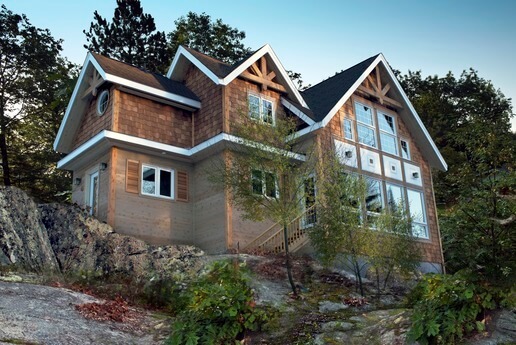 “It’s the cottage and it’s the home,” says Rick Rondeau of Fourteen Estates Custom Home Builders based in Ajax. Clients for his company’s Honey Harbour development in Port Perry are mostly under 40 and primarily from the Ajax-Pickering-Whitby corridor. They’re GTA commuters looking to combine a house and a cottage in a location that offers good neighbours with lots of private space and maybe a pool for their children to play in. Rondeau categorizes this demographic in two classes: those who can afford the dream house and property worth $2.5 million and those who are “stretching” to spend $1.5 million. “These are figures unheard of 15 years ago,” he says, noting the home amenities that were once considered luxuries are now necessities. Erin Miller, sales and marketing manager at Remington Homes in Vaughan, agrees. Her company’s projects were mostly in the GTA, but the growing demand for four-season homes in cottage country presented an opportunity to diversify. Remington Homes is currently well into first-phase sales of its Captain’s Cove project in Midland. Buyers are mostly empty-nesters from Brampton and Mississauga who are looking for a different product site and a more laid-back lifestyle. 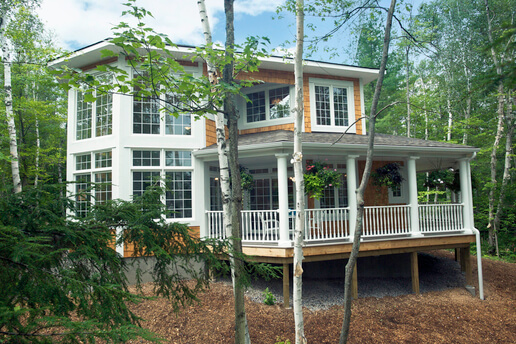 Linwood Custom Homes, based in the Peterborough area, specializes in award-winning house plans and custom home packages. Concentrating in the Kawarthas, Haliburton and Muskoka, the company ships its products across Canada, the U.S. and worldwide, and has built nine homes as a major prize for the Princess Margaret Lottery. According to Linwood’s sales and interior design consultant, Mark Crampton, most clients are asking for 1,000 to 1,550 square foot homes with open concept kitchen/dining room/great room for enjoying family time. 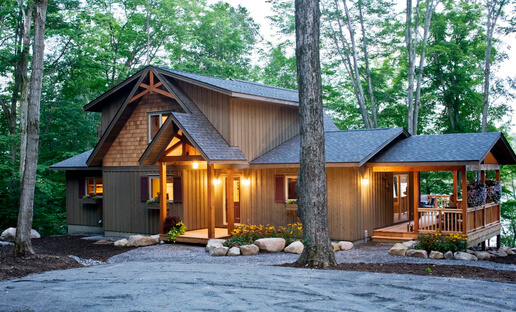 Shipping materials and building homes in cottage country presents several challenges — which just happens to be the company’s specialty. “It’s a very site-specific process. With rocks and slopes, design is very dependent on the lay of the land,” he says. Crampton cites one project where excavation wasn’t possible below one foot, so a heated slab needed to be installed and the mechanical room situated on the main level. Building on an island property on Stoney Lake near Peterborough, Linwood crews needed to transport materials by barge in late fall, wait until the lake was frozen, then cross by snowmobiles and trucks to erect the building. Scott Wootton of Kawartha Lakes Construction has been in the cottage country renovation business for many years. Always forward-thinking, he was one of the first contractors to keep urban clients up to speed on their cottage renovation projects through the internet and digital photos. Most of Wootton’s work involves upgrading existing three-season cottages to four-season homes for eventual retirement. Renovations of $1 million-plus are not unusual for his company, which is busy with a large variety of projects, each with their own unique requirements. One recent job required a cottage — with difficult access — to be lifted 12 feet in the air and positioned on piers to create a living walkout basement. 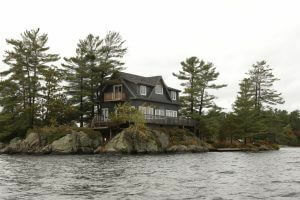 “It’s never simple in cottage country,” says Wootton. “But the biggest challenge facing owners of lakefront properties is the continual increases in setbacks legislated by local municipalities.” As an example, Wootton cites one lake in the Peterborough area that is under the jurisdiction of four separate townships. Whether it’s young families looking for a home base with lots of space away from the urban jungle or empty-nesters planning to retire on a quiet lake near a charming town, many Ontarians continue to embrace the cottage country lifestyle. Gone are the days of rustic retreats. 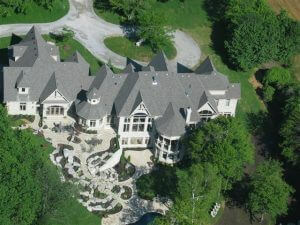 Today’s “cottages” are state-of-the-art homes with all the amenities of urban living. 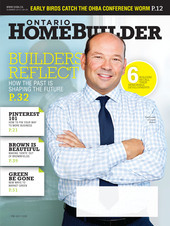 To purchase a copy of Ontario Home Builder – Summer 2012, click here.